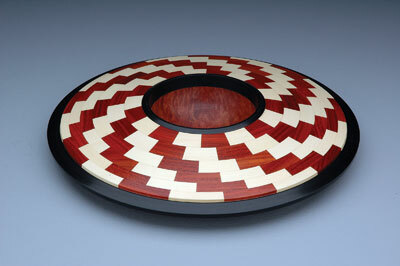 Raised in rural Michigan, Faucher has worked with wood since childhood. "I cut and split red oak for firewood from our woodlot with my father, nailed acres of spruce roof boards while working for my uncle and skied on metal- edged hickory boards," he recalls. Faucher was also exposed to wood as an artistic medium, thanks to his parents' love of art. Today, Faucher's stunning works of art can be seen as the result of a life spent exploring wood as a material and design as a passion. "When I was young, my parents would take me to the Detroit Art Institute," he recalls. "They have Louise Nevelson's ‘Homage to the World' in their permanent collection and I was intrigued by its modular repeating surface and remember returning to it repeatedly. There were bits and pieces of information - like a computer motherboard - and I found the texture alluring." 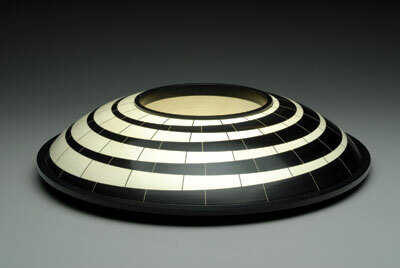 Living in Taos, New Mexico in the early 1970s, Faucher became aquainted with Native American pottery, which ultimately proved an influence on his work in wood. "The white backgrounds and the geometric repeating surface work in terrific reds, oranges and blacks really appealed to me and the pots are a continuing inspiration." Faucher attended college in Indiana and Graduate School in Boston, which was followed by what he refers to as a "misspent youth in the Middle East, Europe and California". During this time he worked as a magazine editor in Philadelphia in the late 1960s, where he managed the flow of work, as well as the magazines' graphics and worked closely with the design department. During these years, he was impressed with the visual language and innovative design work of Seymour Chwast and PushPin Studio. Eventually, Faucher set up his own workshop in North Central Massachusetts, where he created a number of traditional designs that called for turned parts. He worked on an antique Boice crane with noisy bearings and open pulley wheels. 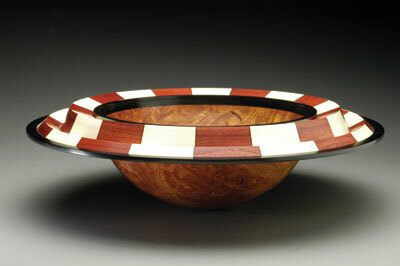 "Peter Child's Woodturning was my constant companion," he recalls. An influential turner in Faucher's life was Russ Zimmerman, who offered a locally famous woodturning workshop in the basement of his home in Vermont, where he taught three at a time on Myford lathes, with bed and board at his home. "He was opinionated and imperious, but he taught a generation or two of New England turners in the early days, myself included," Faucher says. It was in 2000 that Faucher felt he needed to change direction. He was running a furniture business that was, whilst thriving, exhausting him creatively. "I was repeating myself," he says. 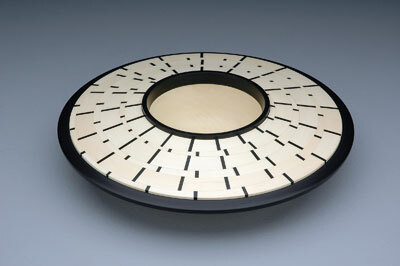 "I wanted a fresh direction that would refocus what I had learned about wood over a 30 year career." 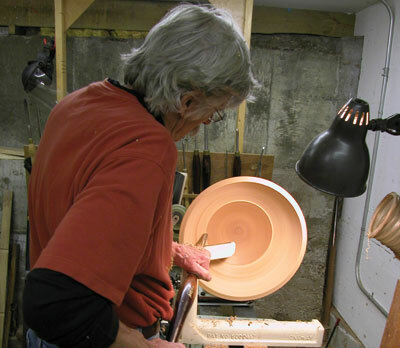 Faucher joined the Central New England chapter of the AAW (American Association of Woodturners) and sought out woodturning instruction. 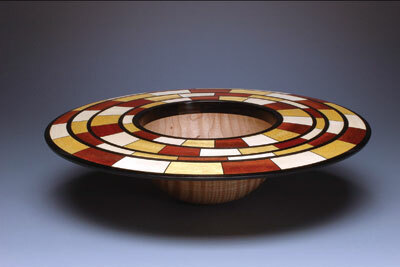 Wendy Wilson offered a three-day workshop in green woodturning at the Worcester Craft Centre, which he took, along with the three-day demonstration workshop offered by David Ellsworth. The latter experience led to him visiting Ellsworth's workshop in the town of Quakertown, Pennsylvania. "Beth Ireland was teaching her own woodturning class at WoodCraft in Woburn, Massachussetts and I studied with her for a few months," Faucher says. 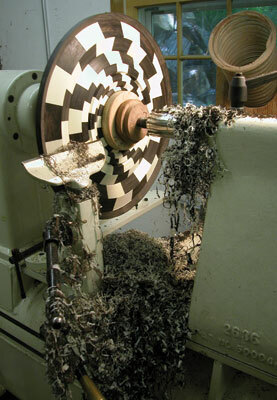 "At this point I was still building furniture but also building my lathe skills and beginning to understand how the lathe might be used to get at some of the forms in my imagination. 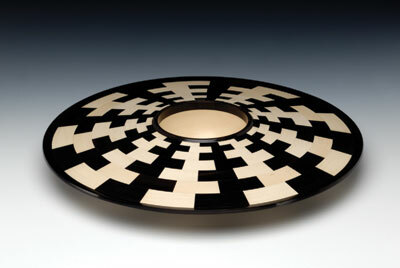 Beth had a session on segmentation and illustrated the technique by assembling eight pieces into a ring and gluing the ring atop a rough bowl. Here was an idea that resonated with me. It was simple and I could master it." In working with the wood movement issue, Faucher realised that if the ring joints could be overlaid with another ring, it would have a brick wall effect and the joints would be bound. If he proceeded vertically with this idea, he would have a traditional segmented form. But Faucher wanted to push the limits of this technique. "What if I moved laterally?" he asked himself. "I knew I could then create a two-dimensional surface with unlimited design possibilities. But how was he to do this?" Faucher contacted a friend who owned a machine shop and together they worked out a procedure for cutting and assembling rings. Eureka! 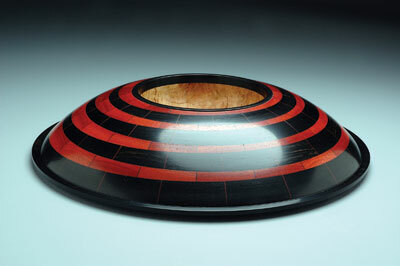 He had moved from the simple to the complex in four years of turning wood - moving from the centric to the eccentric. Today, Faucher exhibits his work at approximately six art shows a year and his production is organised in relation to these events. "What I make is somewhat driven by what I think I can sell at a particular show," he says. There are definite efficiencies of scale in his production. 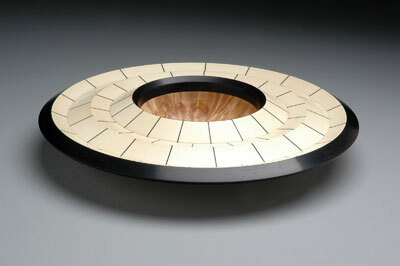 After designing a group of 20 pieces for a particular show, he will move through the entire set performing the same tasks: roughing out, cutting segments for the first ring - usually in ebony - gluing the first ring to the bowl blank, milling the outside diameter of the first ring, and so on. 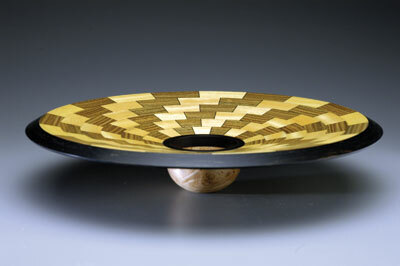 All designs for this series of work are based on an 18-piece ring, as he has found that 18 pieces - plus 18 pieces of veneer in some cases - are as much as he can handle in a glue up. "There is a lot of repetition in making one of my elaborate pieces," Faucher says. "Chop, chop, chop, tweeze, tweeze, tweeze, glue, glue, glue. There is little sense of developing form as these pieces are assembled, as I work from a cross-sectional drawing which gives me the sizing of each ring. The form does not emerge until this assembly is turned." The works present a constant challenge of paying attention, maintaining tolerances, and to stop, stretch and hydrate. Yet, the thrill is in executing a new design and the need to sell and keep the process moving. "My drafting table, drafting tools and sketch book define the design process," Faucher says. Today, Faucher's workspace is a timber-framed barn attached to a 1840s Greek Revival home. A separate shed houses burl and Faucher's unturned wood collection, and the second floor of the barn comprises the twice-turned drying space. "The idea for doing this was to reduce my overheads to as little as possible as I experimented with a new way of expression and a new way of making my livelihood." Today, as his business becomes more viable, Charles is investigating relocating to a historic mill in Harrisville. "This would give me more space and more local exposure". "There is a lot of repetition in making one of my elaborate pieces"